Published on 11 Jun 2017 sunset drone flight in 4K 60fps! In time for what would have been founder Steve Job’s 62nd birthday, the company has announced that it will begin moving its 12,000 employees into the futuristic facility this April. Apple released a new video documenting construction progress, reports the Architectural Record. 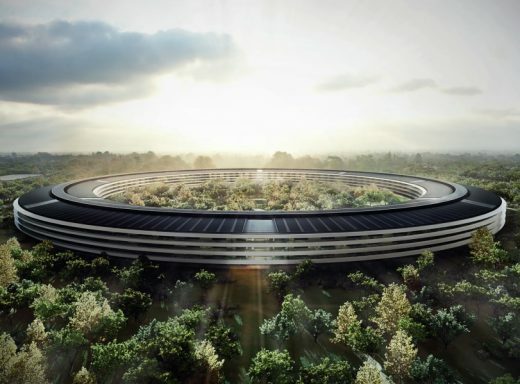 Though Apple Park is defined by its gleaming 2.8 million-sqft, donut-shaped main building, the 175-acre campus will also include a visitor’s center, an employee fitness facility, two miles of trails, 9,000 trees, meadows, and a pond. The company also released a rendering of the Steve Jobs Theater, a 1000-seat auditorium housed in a glazed cylindrical volume topped with a carbon-fiber roof. The campus is due to rely solely on renewable energy sources – in an indirect but welcome riposte to the new President’s anti-climate change agenda – including on-site solar power. Natural ventilation will allow the building to operate without heating or cooling for nine months of the year, according to Apple. The employee move will take approximately six months, with construction occurring concurrently. This new development will provide a serene environment reflecting Apple’s brand values of innovation, ease of use and beauty, according to Apple. The entire 176-acre site will be redeveloped with sustainable, state-of-the-art office, research and development facilities. The project replaces the current disjointed assemblage of aging corporate facilities with a single high performance office, research and development building, with supporting facilities. The buildings are located in a unified and secure landscape, which extends and connects the interior workplaces to outdoor facilities for relaxation, recreation and reflection. The entire Campus, indoors and out, is intended to promote shared creativity and collaboration, and spur invention of the next several generations of Apple products. 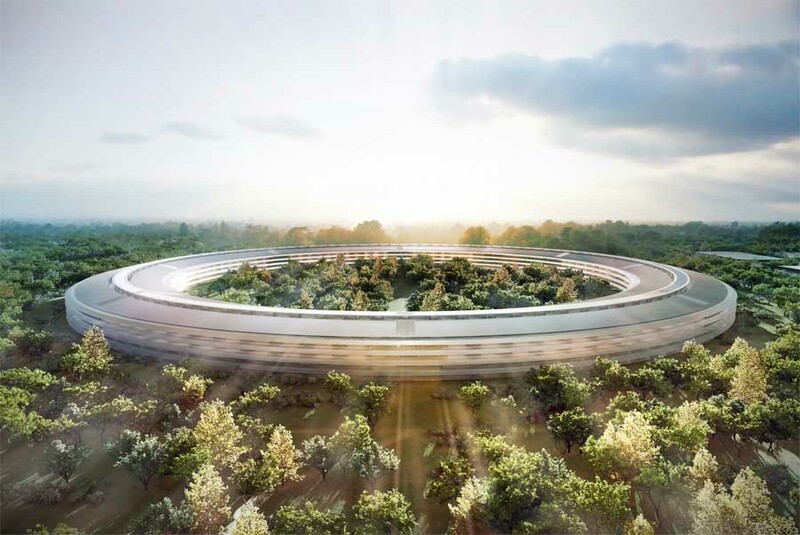 At its October 15, 2013 adjourned regular meeting, the Cupertino City Council approved the Apple Campus 2 project. It allows for the construction of 3.42 m sqft of office, research, and development buildings; 120,000 sqft (1,000 seat) corporate auditorium, 100,000 sqft corporate fitness center, and 25,000 sqft Valet Parking Reception uses; 92,000 sqft of utility plants; and associated parking facilities and ancillary buildings. Major new ring-like campus, a really refreshing and bold design – but having heard so many reports about how the circular BBC building in west London failed in terms of communication and logistics you have to wonder how this will pan out once built. However the private garden inside and the circle as a powerful form are certainly attractive. An integrated, unified and secure 21st Century campus surrounded by green space. Apple selected the internationally renowned architectural firm Foster + Partners, headed by Norman Foster, as architects. 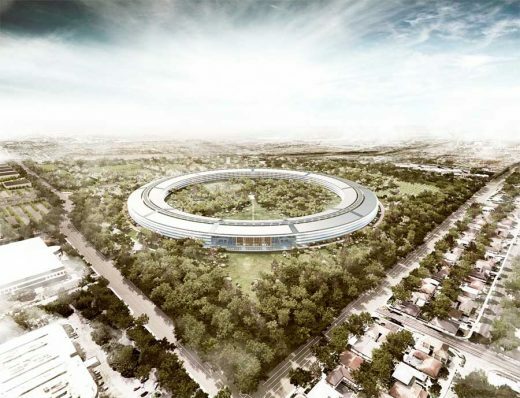 Foster + Partners has drawn upon its global leadership in sustainability and design to help achieve Apple’s goals. The signature Main Building accommodates up to 12,000 employees and comprises approximately 2.8 million square feet in four stories, resulting in a significant reduction of overall building footprint when compared to the facilities that exist on the site. The Main Building is located and designed to minimize the visual impact on adjacent residential neighborhoods and to enhance the existing deep landscape setbacks at the periphery. Campus amenities will include a striking restaurant within the Main Building, a separate Corporate Fitness Center comprising approximately 100,000 square feet, and a 1,000-seat Corporate Auditorium comprising approximately 120,000 square feet. There will be approximately 10,980 parking spaces. 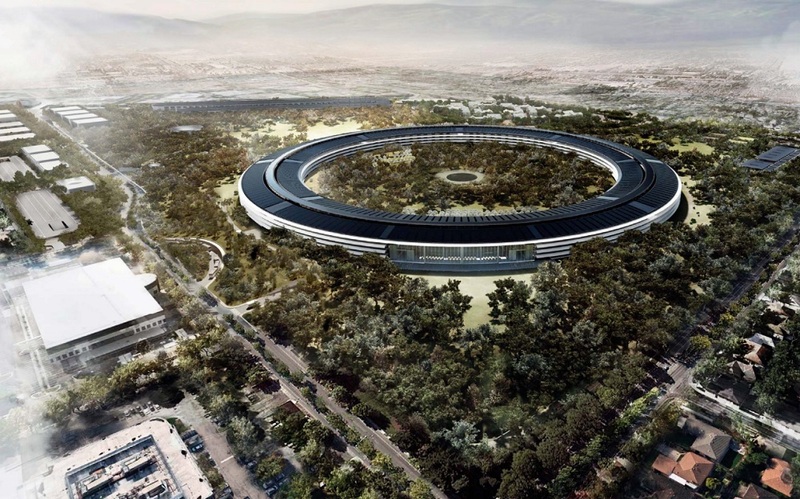 Of these, approximately 9,240 parking spaces will serve the main site of Apple Campus 2. The parking spaces on the Main Building site will be divided between a basement below the Main Building and an above-grade parking structure situated along I-280. The Campus will feature a Central Plant that is integrated with the parking structure and serves all buildings on the Main Building site. development east of North Tantau Avenue and approximately 300,000 square feet west of North Tantau. The 600,000 square feet of office, research and development space will comprise Phase 2, which is scheduled to commence construction after Phase 1 is completed. These additional buildings will house office and research and development functions that need to be located adjacent to the Main Building, and will be supported with approximately 1,740 parking spaces. Integration and unification of the currently divided parcels will be achieved by reclaiming Pruneridge Avenue as green space. Access to the Hamptons Apartments from North Wolfe Road at Pruneridge Avenue will remain. The project replaces existing asphalt and hardscape with over 100 acres of landscaped green space. The landscape design of meadows and woodlands will create an ecologically rich oak savanna reminiscent of the early Santa Clara Valley. It will incorporate both young and mature trees, and native and drought tolerant plants, that will thrive in Santa Clara County with minimal water consumption. The increase in permeable surfaces will promote natural drainage and improve water quality in Calabazas Creek. The thoughtful and extensive landscaping will recall Cupertino’s pre-agricultural and agricultural past, which will be further acknowledged by preserving and relocating the Glendenning Barn to a more appropriate on or off-site setting. Apple Campus 2 will promote creativity and collaboration by consolidating up to 14,200 Apple employees in one location. 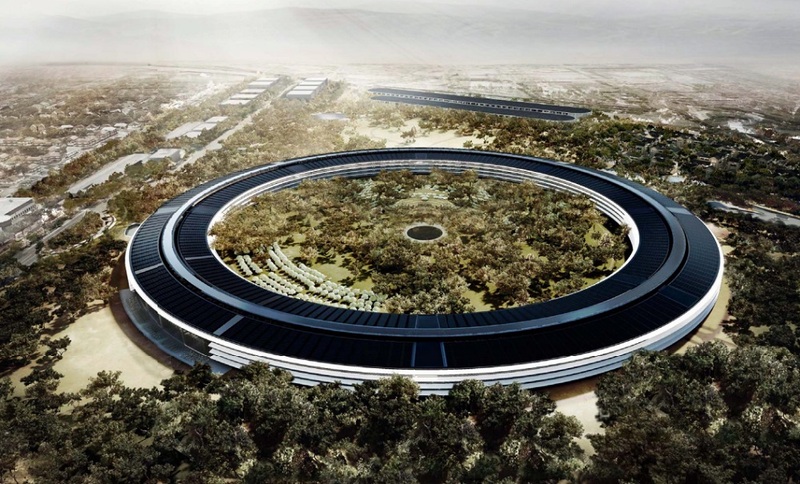 Apple will continue to occupy the existing Infinite Loop Campus, as well as other buildings within Cupertino. The project generally aligns with Cupertino’s existing planning framework set forth in its General Plan, and the policies established for the Vallco Park North Employment Center. It maintains the residential neighborhoods, minimizes additional infrastructure demands and expands the existing perimeter protection to meet Apple’s security needs. The project will strengthen Cupertino’s competitive position in Silicon Valley and help Apple continue to attract the industry’s leading talent. Apple Campus 2 will become a model for the 21st century workplace – a fantastic place to work, to create, to collaborate, and to shape future technology.